Warren Sanders reported at the TVCUC Board Meeting on Tuesday, April 9th, that Loudon High School has identified the 10,000 child to receive a refurbished computer from the Technology Access Program (TAP). A celebration of this milestone event is scheduled at the high school in May. More to follow on that event as the planning firms up. In the meantime, the current status of computers delivered and children helped through TAP is available Here. TAP has some toner cartridges that are free to club members. We have cartridges for HP, Dell, Brother, Samsung, Lexmark, Canon and Sharp laser printers. If you have a laser printer made by one of those companies, stop in at TAP and see if we have one that fits your printer. Bring your cartridge number. Some cartridges do not identify the printer(s) they work in. The printer cartridges are free to members! TAP needs to free some storage space. Cocke County School District, Tennessee. as a donation to the school. TAP continues to assist students and non-profits throughout East Tennessee and will soon reach a major milestone by providing the 10,000th student with in-home access to computer technology. The official number of children assisted is now 9,813, and 105 systems have been provided to schools and social agencies yet to be reported back to TAP. Multiplying the outstanding 105 systems by our historical ratio of 1.5 children helped per systems provides an estimate of 157 children more likely to be added to the tally of students helped by systems already donated. Adding the 157 probable children to 9,813 children already documented yields an estimate of 9,970 helped to date. That is only 30 children short of 10,000 milestone!! TAP has recently started working with two schools in Cocke County and so far have delivered about 60 systems for students in those schools. One of these schools is Grassy Fork Elementary School in Hartford, Tennessee. Both Cooke County schools are doing a good job of teaching low-income students and sought the donation from TAP after learning of the Club’s program for helping disadvantaged students. 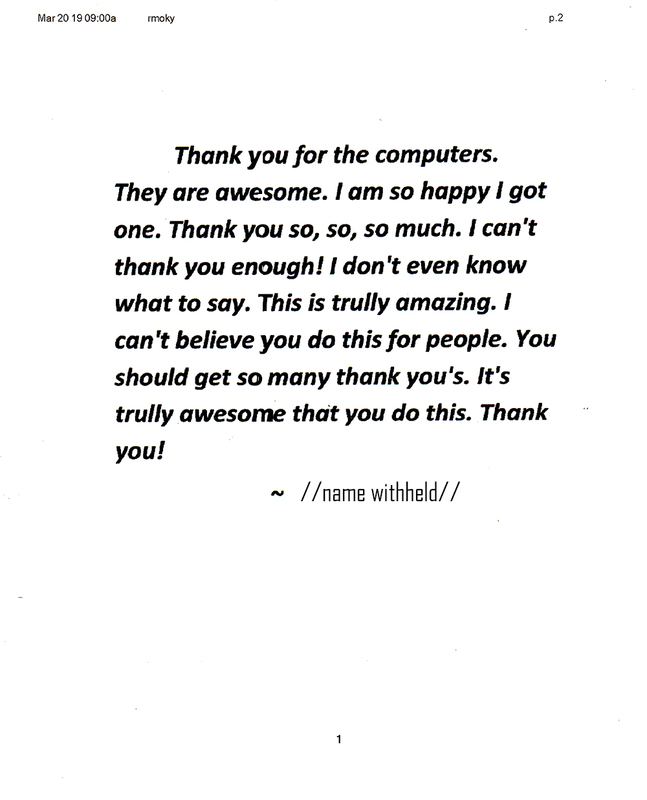 The schools provide the donated computers only to low income families with children who were well motivated to succeed. 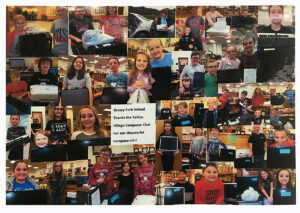 In response to the donation, Grass Fork Elementary provided a photo collage of students that benefited from the TAP donation. The picture is hanging in the TAP office here in Tellico Village. There are other schools in nearby counties that we can assist by providing systems for their students. That cannot be done without equipment to refurbish, and at the present time TAP has critical need for more computers and monitors. There are days when there is nothing for volunteers to work on. If you have computer equipment that is not being used, please bring it to TAP. WE NEED IT! At the end of December, the total number of computer systems distributed in 2018 is 862, a new annual performance record beating the old record of 840 systems in 2017. 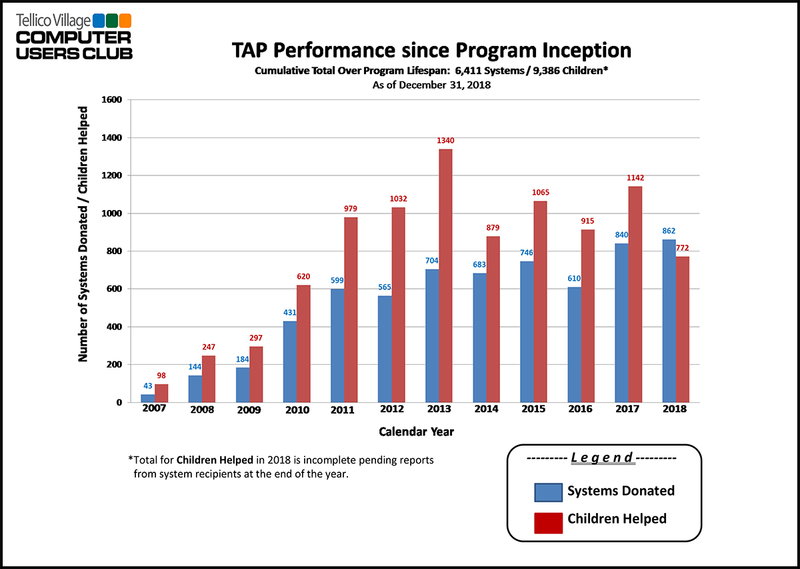 Also, at the end of December, the TAP system donations for the year benefitted 772 deserving and underprivileged children (documented on Dec 31st), but that number will increase over time as we receive additional reports from the agencies that received the TAP donations. For example, the total number of documented children helped presently is already at 836 for 2018, an increase of 65 children provided with in-home computers reported after December 31, 2018. And this number will continue to increase, because we have not heard from recipients of about 150 (including the 93 systems delivered to Caverna, KY in November and others delivered in December) of the 862 systems that were donated in 2018. The final numbers for 2018 may not be reported until March this year or later. 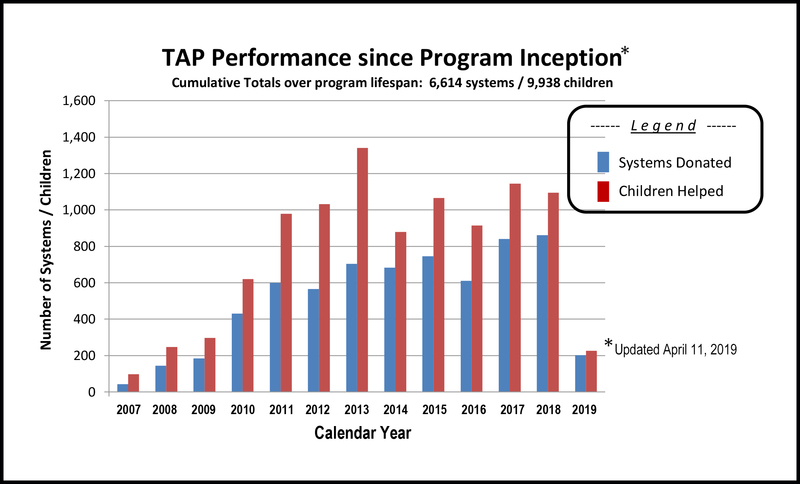 The chart below depicts the total annual TAP donations over the lifespan of the program so far. All numbers shown except for 2018 children helped are final. As you can see, the total number of systems given out through December last year is 6,411, helping more than 9,451 children to date (including the 65 reported this month so far)!